Thank you for your recent letter roundly criticizing our treatment of the Taliban and Al Quaeda detainees currently being held at Guantanamo Bay , Cuba . Our administration takes these matters seriously and your opinion was heard loud and clear here in Washington . You'll be pleased to learn that, thanks to the concerns of citizens like yourself, we are creating a new division of the Terrorist Retraining Program, to be called the "Liberals Accept Responsibility for Killers" program, or LARK for short. Ali Mohammed Ahmed bin Mahmud (you can just call him Ahmed) is to be cared for pursuant to the standards you personally demanded in your letter of complaint. It will likely be necessary for you to hire some assistant caretakers. We will conduct weekly inspections to ensure that your standards of care for Ahmed are commensurate with those you so strongly recommended in your letter. Ahmed will not wish to interact with you or your daughters (except sexually), since he views females as a subhuman form of property. This is a particularly sensitive subject for him and he has been known to show violent tendencies around women who fail to comply with the new dress code that he will recommend as more appropriate attire. I'm sure you will come to enjoy the anonymity offered by the burka-over time. Just remember that it is all part of "respecting his culture and his religious beliefs"-wasn't that how you put it? 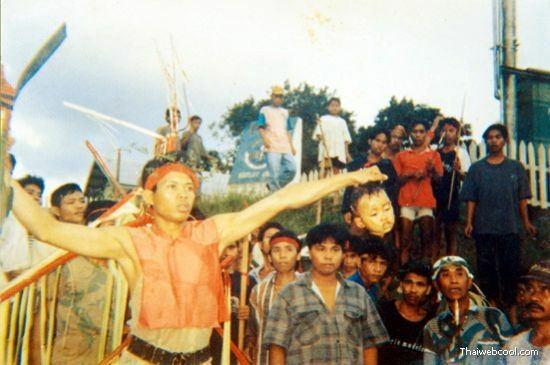 This is a photo of Ahmed valiantly showing off the severed head of an Indonesian Christian child.